mum’s “Now that’s what I call music playlist’? Perhaps you just love the vibe of a good party. a chic cosmopolitan Lagos location. choice French wines. Other features include light fireworks, makeup touch-up booth etc. 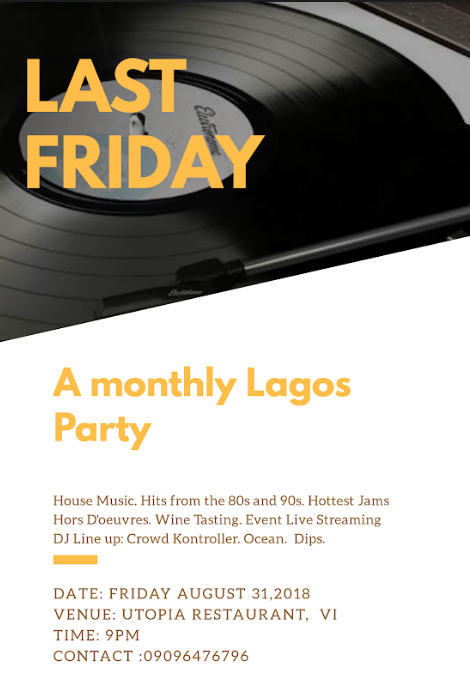 Venue: Utopia Restaurant, 11b Goriola Street, Off Adeola Odeku, Victoria Island. Music Policy for the maiden edition on August 31st; Crowd Kontroller, Ocean, and Dips.